Now available on macOS and Windows! Make breakthrough improvements to a product or a process with Design-Expert software. You can not only screen for vital factors, but also locate ideal process settings for top performance and discover optimal product formulations. 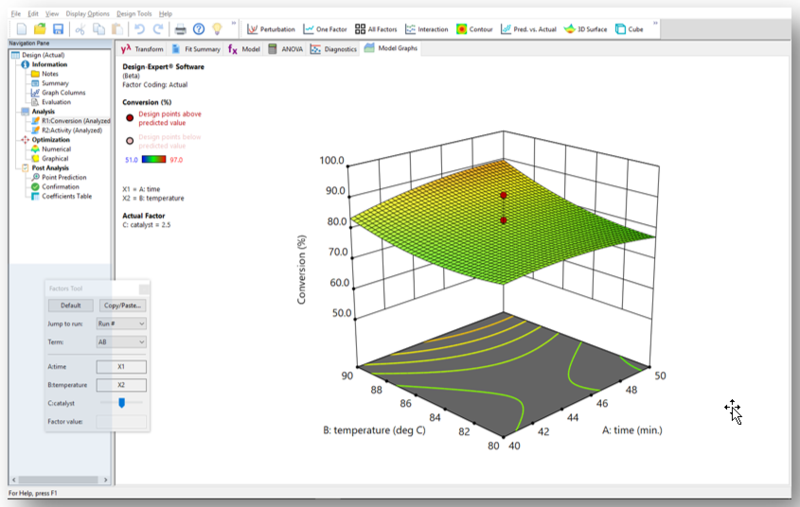 Easily view response surfaces from all angles with rotatable 3D plots. Set flags and explore contours on interactive 2D graphs; and use the numerical optimization function to find maximum desirability for dozens of responses simultaneously. For a list of features and more, scroll to the bottom of the page. Try the free 30-day trial! Annual Network licenses include free upgrades, updates, and technical support as long as your license is current. Requires installation of license manager (RLM). New Single-User license purchases include 12-months of FREE Annual Support and Maintenance (AS&M)—a $297 value. AS&M includes upgrades, updates and technical support. AS&M must be renewed on an annual basis to continue receiving support and maintenance. Only Single-User licenses can be upgraded online. New Single-User Upgrade purchases include 12-months of FREE Annual Support and Maintenance (AS&M)—a $297 value. AS&M includes upgrades, updates, and technical support. AS&M must be renewed on an annual basis to continue receiving upgrades, support and maintenance. Please click here to inquire about an academic license. You may also contact Stat-Ease or call 612.378.9449 for help. You may find it most convenient to purchase the software from a Stat-Ease reseller. Click here for a list. Two-level factorial screening designs: Identify the vital factors that affect your process or product so that you can make breakthrough improvements. You’ll find a wealth of statistical details within the program itself via various Help screens. Take advantage of this information gold-mine that is literally at your fingertips. Also, do not overlook the helpful annotations provided on all reports. They are available for purchase on the Stat-Ease web site, via Amazon, or directly from the publisher—Taylor&Francis/CRC/Productivity Press (New York, NY). Those of you who’ve used previous versions of Design-Expert software will be impressed with the many improvements in Version 11. Do not hold off. Upgrade now! Easily configured multiple windows: At the touch of a button arrange your view as you like it! For example, see a three-way display below for various tables from DX11’s analysis of variance report. 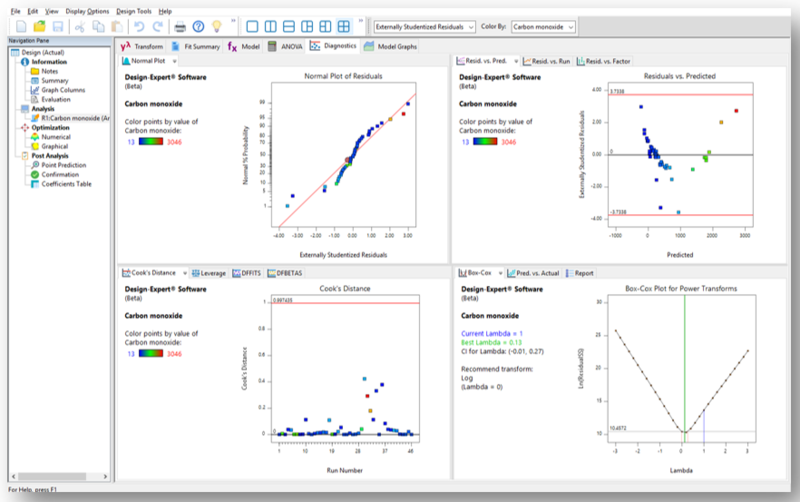 Diagnostics graphs provided in multigraph view: Take advantage of side-by-side and up-down comparisons via the four-window option on the pane-configuration tool. Toolboxes can be docked and resized: Move controls, for example the tool that controls factor setting in this 3D response surface, to most convenient locations! Ctrl–scrollwheel zooms in/out of reports, increasing/decreasing the font size. “Remove/Add Curvature” button for factorials with center points. 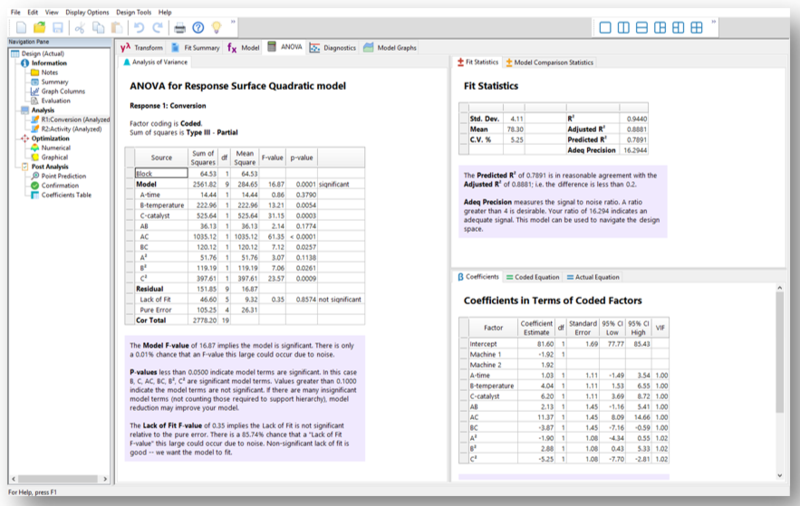 Improved ability to confirm models at multiple points—made easy by tabs. Note: Screen shots done with older versions may look different than your version of software, but still remain helpful. Network version requires installation of the Reprise License Manager (RLM) as a service. May be installed on a virtual server that is assigned a static ethernet MAC address. Network bundle containing the 32-bit Reprise License Manager and utilities, Stat-Ease settings file, and documentation. Network bundle containing the 64-bit Reprise License Manager and utilities, Stat-Ease settings file, and documentation.